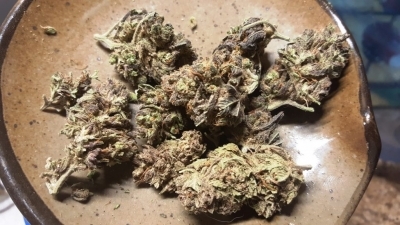 Genetics: Purple Kush is a mix of Hindu Kush and Purple Afghani. It is a fan favorite anywhere it reaches out to, and could become one of yours as well. Flavor & Aroma: PK combines the earth and pine flavors of Indica with a touch of grape as well. With more herb than fruit taste, the purple hairs may confuse your eyes, but not your taste buds. Effects: Purple Kush is known for it's couch lock. Unless its your day off, I wouldn't recommend taking a hit of this strain until the sun has gone down. Medicinal Uses: Muscle spasms, as well as other varieties of pain are said to disappear once this strain hits your tongue. It has also been used to treat insomnia, stress, anxiety, and some forms of depression. Potency: THC levels crack the 20 mark at just over 21%, with CBD just under the half mark at .4%. Grow Info: 8 week flowering time for average yield.